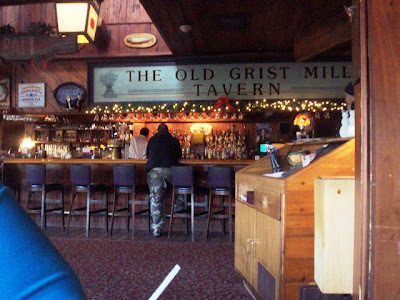 Taking another one of our readers requests, this one from Liz and Aunt Judy, Mom and I decided to hit up the Old Grist Mill Tavern in Seekonk, MA. 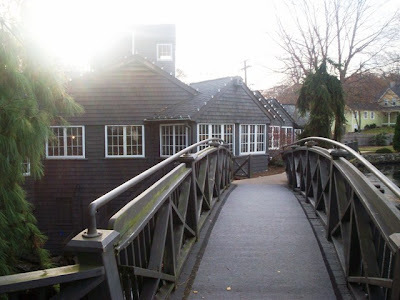 Mom has been to the Grist Mill for several parties, but I had only been to the restaurant one time, and that was on a date! Although the dude turned out to be a dud, I remembered the food being very good, so I was excited to return. We pulled into the parking lot at about 2:30 p.m. There weren't many cars in the parking lot, so when Mom and I crossed the small bridge that led to the front door of the restaurant, there were several ducks that were very excited to see us. Maybe too excited. Perhaps they were looking for handouts, but a quick glance across the Grist Mill Pond turned into Mom and I almost running for our lives from a pushy duck that had followed us onto the bridge. Some of the birds had even climbed up onto the ice and started following us! After our narrow escape, we headed inside and were greeted by a friendly hostess. 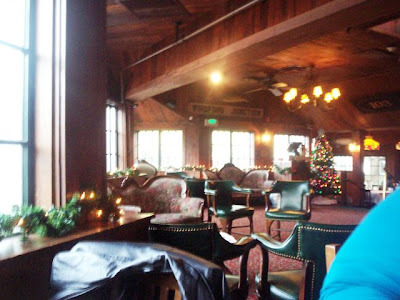 She seated us in a little area across from the bar (near the door) that housed a few tables, a long banquette, and even a few armchairs that took the place of regular chairs. It was quite cozy. The hostess left us with two paper menus that listed the lunch options. From the outside sign, we saw that lunch was served until 3 p.m. She filled the two glasses on our table with ice water and left us to browse the menu. It wasn't a very large list, but that is typical during restaurant lunch hours. The selections (and specials) sounded really good. A few minutes went by before we were greeted by a man in a black and white uniform who was to be our waiter. His name was Ray, and he was also the bartender. He took our drink order - two Diet Cokes - and promptly returned with our drinks (with lemons) in glasses. Ray asked us if we were ready to order, and we were. Mom chose the chicken club ($7.25) and asked for it without tomato. 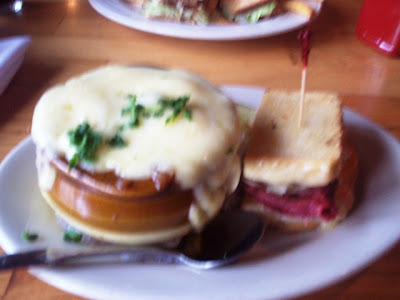 I chose the French onion soup with half sandwich ($8.75), and for my sandwich I chose a Reuben. After a failed attempt at having a Reuben at another restaurant, I was ready to try again. 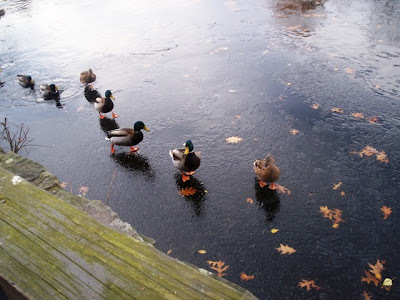 Ray took our menus away while Mom and I looked out the window and watched the ducks float around the icy water. A few minutes later, Ray brought over two rolls in a basket with a cup of butter. They had crispy outsides with soft middles, and were very good. I really think this restaurant is beautiful. It is very much a tavern with its dark woods, low lights, and old fashioned decor and furniture. Having decorated for the holidays, the Grist Mill staff had set up a Christmas tree over by the stairs leading to the dining room. Also, each window was decorated with strands of lighted garland and a few Santa statues were spotted throughout the bar area. The bar was beautiful. Topped with a large sign and surrounded by high, wooden bar stools, it seemed the perfect getaway from the noisy outside world. There is even a large skylight right in between the bar and the main entrance. Although we didn't get to see the dining area today, it is a sunken room that is broken up into several sections. There is a large salad bar, a place where brunch is served, the regular dining room, and a few areas for parties. Each table, although there is no table cloth, is set with plates, water glasses, cloth napkins, and pleather-bound wine and dessert menus. The view here is lovely. From the many windows, you can see the bridge, waterfall, water wheel, and the pond. I'm sure there are many more options on their dinner menu, but for a lunch menu, the Grist Mill offers some interesting choices. Appetizers include lobster stuffed mushroom caps ($7.95), which are topped with Swiss cheese, crab cakes ($9.95), containing lump crabmeat with sauteed onions, peppers and celery, jumbo shrimp cocktail ($8.95), loaded potato skins ($5.95), calamari (8.95), clams casino ($8.95), buffalo wings or tenders ($6.95), and grilled littlenecks ($7.95). Soups include the baked onion soup ($3.95), soup of the day (cup $2.95 - bowl $3.75), and clam chowder (cup $3.50 - bowl $4.50). Salads include favorites like the grilled chicken Caesar salad ($7.95), steak Caesar salad ($9.95), lobster salad ($16.95), grilled salmon salad ($11.95), chef salad $(8.95), and the Tavern Salad ($8.95), which has mesculin greens tossed in a raspberry vinaigrette with dried cranberries, roasted walnuts, and blue cheese. You can add grilled, marinated chicken for and extra $2. The luncheon platters include the vegetable of the day and your choice of baked potato, sweet potatoes, mashed potatoes, seasoned fries, or rice pilaf. Choices include the baked scrod platter ($9.95), roast pork platter ($8.95), top sirloin steak ($10.95), Filet Mignon ($15.95), lobster roll ($13.95), roast turkey platter, the Grist Mill meat loaf platter with mushroom gravy, chicken teriyaki, and chicken pot pie. Sandwiches and burgers include the Reuben ($6.95), prime rib ($9.95), Monte Cristo, Fat Boy, and chicken. All sandwiches are served with seasoned fries, and you can add the Fresh Works! salad bar for an additional $2.95. You can also choose to get a 1/2 sandwich with a cup, or bowl, of soup (soup of the day - $7.25; bowl of onion soup - $8.75; you can also choose chowder). If you're looking for something meaty, you can order the Grist Mill burger ($5.95). Topped with lettuce, tomatoes, and onions, you can also add cheese, bacon, and mushrooms. 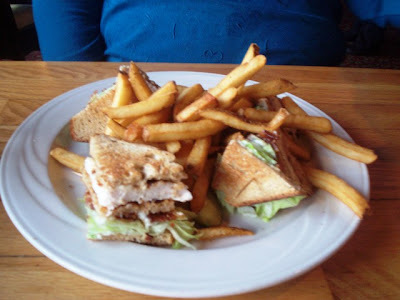 Club sandwiches include the chicken, lobster ($12.95), and tuna. All clubs are made with lettuce, tomatoes, bacon, and mayonnaise and served on toasted bread served with seasoned fries. Add the Fresh Works! salad bar for $2.95. Speaking of the salad bar, the Fresh Works! bar alone is $7.95. You can also add a cup of chowder for $8.95, or a bowl of onion soup. Seafood and pasta choices include the stuffed shrimp ($12.95), sea scallops ($12.95), grilled salmon fillet ($12.95), grilled swordfish steak, fettuccine with scallops and shrimp, and fish and chips. All seafood luncheon entrees include your choice of baked potato, mashed potatoes, sweet potatoes, seasoned fries, rice pilaf, or fresh vegetables. You may add an additional side for $1.50. A buffet-style brunch is served from 10 a.m. to 2 p.m. on Sundays, and if you request it with your party reservations, the brunch can be included. Choices include favorites like scrambled eggs, breakfast meats, salmon, and baked goods. Our food did not take long to arrive, and when Ray brought the plates over, everything looked delicious. Mom's chicken club was terrific. She asked them to hold the tomato, and lo and behold, they remembered. The sandwich came on wheat (she had a choice of breads), and was a nice combination of grilled chicken, crispy lettuce, apple smoked bacon, and a little mayonnaise. The club was cut into neat wedges and held together with plastic toothpicks. It was as attractive as it was tasty. A nice amount of hot fries accompanied the sandwich, and they were very good. Also on Mom's plate was a pickle spear, which I stole since Mom hates them. Mom said she enjoyed her lunch and she would definitely order it again. I apologize that the picture of my meal is so fuzzy. Either the soup was so hot that the steam was fogging up my camera, or I was in such a rush to start eating that I pulled the camera away before the picture had actually been snapped. My French onion soup was served in a crock and was covered with cheese and parsley. After I broke through the cheese, I found that the soup was extremely tasty and chock full of onions. Taking a break from my hot soup, I decided to try my sandwich. Delicious! If this is what a Reuben tastes like, I'm sorry I didn't have the other half. The corned beef was extremely lean (thank God), the bread was toasted, the sauerkraut was fresh, and the dressing was tangy. Although I've had a turkey Reuben before, this was my first time with the corned beef, and I was not let down. This was definitely something that I would get again. We left $25 on the table for Ray, which included a 20% tip. We did not use the restroom on this occasion, but I did grab one of the peppermints from a large bowl that we spotted near the coat check on our way out. Although we had a good lunch, I feel that we really didn't get the full experience of what the Old Grist Mill has to offer. I am looking forward to having dinner here, and judging from the terrific lunch Mom and I had, I'm sure it will be fantastic. My aunt Judy has all her parties here, and she often visits with her sister and friend to the Sunday brunch. Perhaps we'll have to tag along! 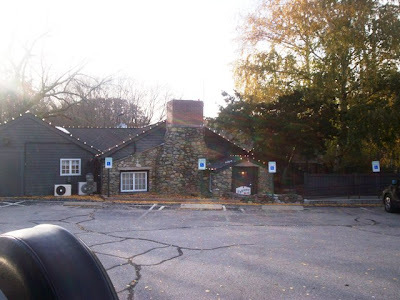 The Old Grist Mill is open from 11:30 a.m. to 10 p.m., Monday through Saturday, and 10 a.m. to 9 p.m. on Sunday.